A handful of races kept the Bognor Tone Zone runners busy on a cold weekend. On Saturday Peter Ramsdale and Jess Thomson set off for their first half marathon of the weekend, the Phoenix Jaw Dropper, a flat race near Walton-on-Thames. Thomson crossed the line first for the club in 1hr 40min with Ramsdale running under the two-hour mark, finishing in 1:58. Also held on the Saturday was the Brutal Spider Hill 10k, an extremely tough off-road course with obstacles thrown in. Sarah Santer was the solo runner for the club and finished in a very respectable time of 1:20. The following day saw two half marathons and a full marathon visited by the blue and orange contingent. The Phoenix Riverside Marathon was run by Jude Bazeley, who finished in a time of 5:45. The Bedgebury Forest half marathon saw Zoe Hemes and Vicky Cooper compete. Taking part in her first half marathon, Hemes ran with Vicky Cooper and both runners finished in 2:11 on the undulating course. Five club members took on the Gosport Half Marathon. 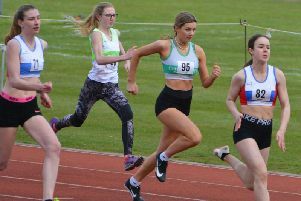 Jess Thomson, running her second half marathon of the weekend, recorded a PB time of 1:35 – another PB went the way of Adam Norgett who finished in 1:45. Tony Holcombe and Peter Ramsdale, who was also running his second half marathon of the weekend, finished in 1:48 and 1:53. Stuart Thomson rounded off the Tone Zone Runners in a time of 2:03. Results: Gosport Half Marathon - Jessica Thomson 1.35.31 PB; Adam Norgett 1.45.19 PB; Tony Holcombe 1.48.25; Peter Ramsdale 1.53.29; Stuart Thomson 2.03.30. Phoenix Riverside Marathon - Judith Bazeley 5.45.00. Bedgebury Forest Half Marathon - Zoe Hemes 2.11.46; Vicky Cooper 2.11.48. Phoenix Half Marathon - Jessica Thomson 1.40.38; Peter Ramsdale 1.58.33. Brutal Spider Hill 10k - Sarah Santer 1.20.46.